Here in the land of 10,000 lakes, there's no doubt there's going to be plenty of swimming beaches… and we've got some beauties! Grab a chair, towel and some sunscreen and enjoy your day on any one of our beautiful sandy beaches. Area swimming beaches are managed by many different local agencies. Please contact the appropriate agency for the swimming beach in question. 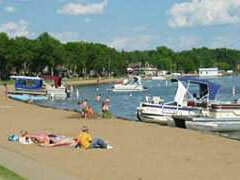 The Detroit Lake Public Beach is a one-mile long white sand beach on the north shore of Little Detroit Lake in the heart of Detroit Lakes. Middle Cormorant Lake Beach is located on Co. Hwy. 5 on the eastern shores of Middle Cormorant Lake in southwestern Becker County. Eagle Lake Public beach is located on the eastern shore of Eagle Lake west of the city of Frazee. The park contains picnic shelters, playground equipment, and horseshoe pits and a public boat launch. Town Lake Public Beach is located on Co. Hwy. 29 on the northeast shore of Town Lake in the city of Frazee. The park also contains picnic shelters and a public boat launch. Wolf Lake Public Beach is located on the south-eastern shore of Wolf Lake approximately 1/2 mile west of the city of Wolf Lake. The waterfront park offers a picnic shelter, playground, ballfields, camping, grills, and public restrooms. The Osage Public Beach is located on the southern tip of Straight Lake in the community of Osage in eastern Becker County.